This 65 page book explains in detail how to memorize Scripture and discusses the 25 advantages and how to overcome problems you may face while memorizing. This book teaches a simple, easy method of memorizing Scripture that has been successfully used by over 100,000 people. The method can be applied to other subjects as well. 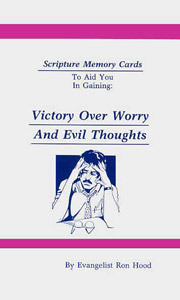 The greatest benefit of memorizing Scripture is that it gives you victory over worry and evil thoughts. Contents: This book contains 30 verse cards (45 verses KJV) all on the subject of victory, as well as instructions on how to memorize Scripture. 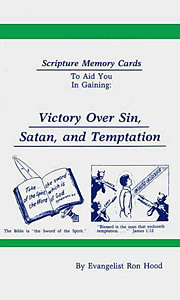 Benefits: Memorizing and applying these 30 passages will enable you to enjoy victory over habits and temptations. Contents: This book contains 30 verse cards (55 verses KJV). All of these verses deal with the thought life. 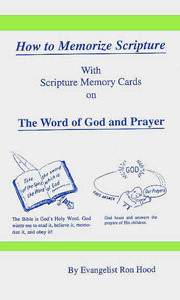 The book also has instructions on how to memorize Scripture. Benefits: Memorizing and applying these verses of Scripture will enable you to control your thinking and enjoy victory over worry and evil thoughts. 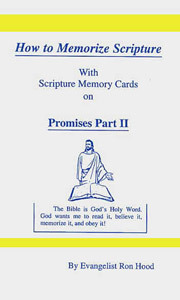 Each verse pack has several pages of explanation and instruction on Scripture memory followed by 12 to 27 Scripture verses or passages on the given topic. 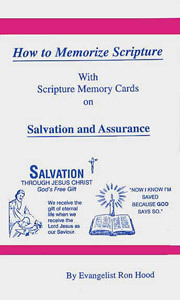 The 108 verses that all Christians should memorize are available on cards in the six booklets pictured below. Contents: This book contains 15 verse cards covering the plan of salvation and assurance. It also teaches how to memorize Scripture and the benefits. Benefits: Memorizing these verses will help with assurance of salvation and equip you for witnessing to others. Contents: This book contains 12 verse cards. All verses are about the Word and prayer. It also teaches how to memorize Scripture and the benefits. Benefits: These verses will help you grow spiritually and improve your prayer life. 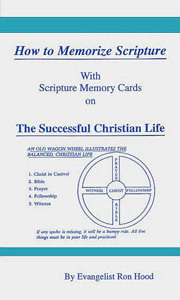 Contents: This book contains 15 verse cards with verses on the balanced successful Chritian life. It also teaches how to memorize Scripture and the benefits. Benefits: These verses teach you how to live a balanced, successful Christian life. 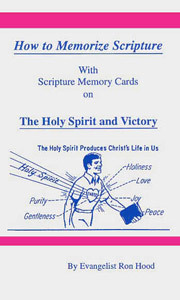 Contents: This book contains 15 verse cards on the Holy Spirit. It also teaches how to memorize Scripture and the benefits. Benefits: These verses teach that we can have victory through the power of the Holy Spirit. Contents: This book contains 12 verse cards. It also teaches how to memorize Scripture and the benefits. Benefits: Memorizing these verses will give you assurance of God's presence, His protection, His provision, and His peace. 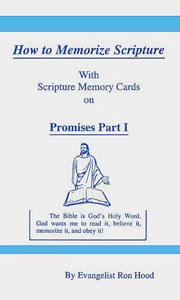 Contents: This book contains 12 verse cards and instructions on how to memorize Scripture. Benefits: These verses give you assurance of God's forgiveness, guidance, strength, and victory.